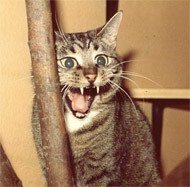 Spoof news: 'Officer Dibble' fatal shooting a 'Top Cat' copycat killing? 'Officer Dibble' fatal shooting a 'Top Cat' copycat killing? Essex - The death of Essex policeman PC Ian Dibbel has rattled creators of a 1960s children's TV cartoon comedy about some feral alley cats living in Manhattan's Hoagie's Alley. The show's felines TC, Benny the Ball, Choo-Choo, Brain, Fancy Pants and Spook were in a long-running spat with their local beat cop Officer Charlie Dibble - whose name became synonymous with English derogatory slang for a police officer. Now Monday's Clacton-on-Sea killing of the off-duty officer is being described as a 'spooky echo' of an April 1962 episode of the animated US show. The 'Dibble's Double' episode sees the feral gang hunt a crook called 'Al' involved in an art gallery heist. Although there are no exact parallels with the cartoon felon and alleged Essex gunman Peter Reeve the show's creators had to pull the episode's original ending where 'Dibble' is fatally shot. A graveyard scene in the episode was also cut and replaced with child-friendly imagery of a soda fountain shop. Fifty years later PC Ian Dibbel's alleged killer Reeve was found dead with gunshot wounds to the head in a Writtle, Essex graveyard this morning. The show's sometime law enforcement canine 'Griswold' the Police Dog has yet to make an appearance in today's fast-evolving Essex gun drama. 'Lazlo-Lazlo' is still singing the blues.